Deluxe Strapping dispenser for PP and PET strapping. Dual metal core holders for 200mm and 400mm ID cores. 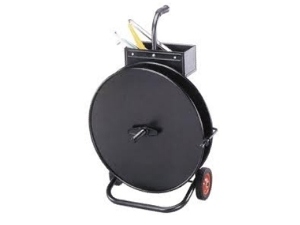 Features include: Heavy Duty Rubber wheels;Spring-loaded Brake Sytem; Heavy Duty metal construction: tray to keep tools in.